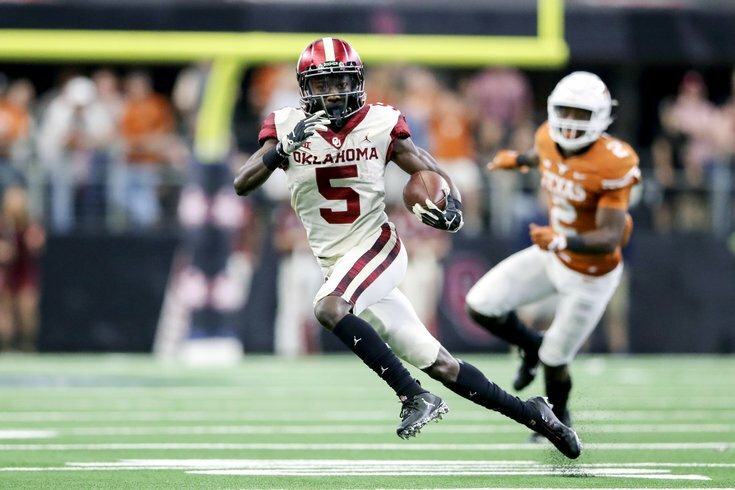 If Oklahoma WR Marquise Brown is still available at pick 25, the Eagles would surely be tempted by the prospect of adding his speed to an offense that already employs DeSean Jackson. Today we'll continue on with the wide receiver position, which is now a strength in the short-term, but if you look ahead, could use some long-term reinforcements. With the addition of DeSean Jackson, the Eagles finally found themselves a speed receiver who will actually put some legitimate fear into opposing defensive coordinators. In previous years, they worked the bargain bin in free agency, signing guys like Mike Wallace, Torrey Smith, and Chris Givens. Still, Jackson will turn 33 in December, and while the team doesn't feel like he has lost a step yet, they would be wise to have a succession plan in place in the long term. At WR1, Alshon Jeffery was playing on low cap numbers, until now. He'll cost $14,725,000 on the cap in 2019, and $15,975,000 both in 2020 and 2021. The front office has cleared up a lot of immediate cap space by restructuring the contracts of players they believe are slam-dunk long-term Eagles, by converting their base salaries in signing bonuses, and stretching out their cap hit over the life of the contract (and beyond). It's perhaps interesting that they have not done the same with Jeffery. The reality is that Jeffery is going to have to continue to perform to see that money. And finally, there's Nelson Agholor, who is playing this season at $9,387,000. He'll be a free agent next offseason. Otherwise, while the Eagles have a couple of recent draft picks in Mack Hollins and Shelton Gibson, as well as a talented pickup in Braxton Miller, none of those guys should be counted on at this point as long-term answers. To be determined if that will change. For now, the trio of Jeffery, Jackson, and Agholor is a very good one, but this is a situation where a team strength could quickly become a weakness, based on what we laid out above. Howie Roseman has stated on multiple occasions that he believes that wide receivers take a year or two to develop. By taking Brown while already stacked at wide receiver, the Eagles could be patient with his growth, as opposed to throwing him to the wolves like they did in 2015 with Agholor. Brown has slot/outside receiver versatility, so he could take over in the slot for Agholor in 2020, and eventually for Jackson on the outside. In the meantime, if he is ready to produce as a rookie, then great, opposing defensive coordinators will to have to worry about an offense that can put both Brown and Jackson on the field at the same time. On the downside with Brown, because he is so small, durability concerns will always persist, and as it is, he's still recovering from surgery to repair Lisfranc injury. Brown is a receiver whose game best translates to the slot at the pro level. He put up big numbers over the last two seasons at Ole Miss. Brown reminds me a lot of a more gifted Golden Tate, for his competitiveness and unwillingness to go down once he has the ball in his hands. If the Eagles liked Tate, they'll love Brown. Harry is reportedly one of the Eagles' 30 allotted pre-draft visits, which is interesting, considering that he possesses a lot of the same traits as Jeffery. As noted above, Jeffery became expensive this season, and will continue to be pricey in 2020 and 2021 as well. We're not suggesting that Jeffery's roster spot is in question, but if they were to draft a guy like Harry, let the speculation begin. Harry has been productive the last two seasons. In 2017, he had 82 catches for 1,182 yards and 8 TDs. In 2018, he had 73 catches for 1088 yards and 9 TDs. Unfortunately for Samuel, in 2015, he missed seven games with a soft tissue injury, and he missed 10 games in 2017 with a broken leg, so there are durability concerns. Samuel projects to the slot in the NFL, and in my view, is a similar player to Brown above. Butler is a very intriguing height-weight-speed prospect, and one many think is worthy of a first-round pick. However, his hands and route-running are concerns that will likely cause him to be drafted on Day 2. Hall is deep threat with good size at 6'2, 201 who has averaged more than 20 yards per catch over his career. Hall is thought of as a one-trick player, though obviously that one trick is a pretty good one. In the NFL, he'll have to develop his game to be effective, however, he would have the time to grow in an Eagles offense that wouldn't need him immediately. With Alshon Jeffery and DeSean Jackson working the perimeter, a player with Isabella's speed could present difficult matchups for slower slot corners. He'd be yet another dynamic weapon in an already loaded passing game, if the Patriots don't get him first. The Eagles don't have any long-term options at returner. Hardman could be that, plus a versatile threat with speed in the regular offense. Oh, and he ran a 4.33 at the Combine. A common trait that the most potent offenses (Chiefs/Rams/Saints) in the NFL share is a dynamic running back who can create mismatches with opposing linebackers by catching the ball out of the backfield, down the field. Pollard has the receiving ability part down, but the tougher evaluation for NFL scouts will be whether or not opposing defenses will respect his ability to run the football at the next level. We'll project him as a slot receiver. At Memphis, Pollard had 139 carries for 941 yards (6.8 YPC) and 9 TDs. Those are good numbers, but represent a small sample size. Still, a creative offense should be able to find ways to get him involved and making plays in the NFL. At his pro day, Williams ran a disappointing 4.53, with a crappy 31.5" vertical jump and 116" broad jump. Still, Williams' talent is obvious, and would be a good fit in the Eagles' offense on the outside. The Eagles were interested in Joe Mixon during the 2017 NFL Draft, and don't seem opposed to drafting players with serious character concerns, including ones involving domestic violence. However, they will obviously do extensive homework on players like Williams. Projected round: Very difficult to say, given his red flags. The guess here is someone will take a shot on him in Round 6 or 7.